Yaxchilán is located on the south bank of the Usumacinta River, in Chiapas, Mexico. It was a significant Maya center during the Classic period (250-900 C.E.) and a number of its buildings stand to this day. Many of the exteriors had elaborate decorations, but it is the carved stone lintels above their doorways which have made this site famous. These lintels, commissioned by the rulers of the city, provide a lengthy dynastic record in both text and image. Yaxchilán lintel 16 (commissioned by Bird Jaguar IV for Structure 21), after 752 C.E., Maya, Late Classic period, limestone, 76.2 x 75.7 cm, Mexico © Trustees of the British Museum. Lintels 24, 25 and 26, set above the three doorways of Structure 23, depict a series of rituals performed by Shield Jaguar II and his wife. Structure 21, commissioned by Bird Jaguar IV, housed lintels 15, 16 and 17. Bird Jaguar was Yaxchilán’s most prolific builder and at least a dozen major structures were initiated or remodelled during his reign. 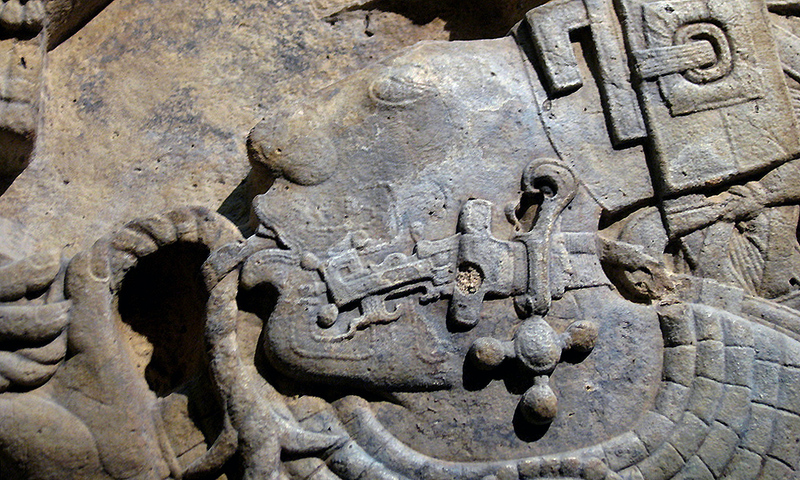 In this lintel above, Bird Jaguar IV dominates a captive. Scenes representing the public display of captives occur frequently in Maya art. The capture of sacrificial victims was an essential aspect of Maya warfare, as they were necessary for many rituals. Accession rituals, for example, entailed the offering of dedicatory human sacrifices to mark the enthronement of a new ruling lord. Lintels 24 and 25 are on permanent display in the British Museum’s Mexican Gallery. Lintel 26, the third in the series, is in the Museo Nacional de Antropología, in Mexico City. 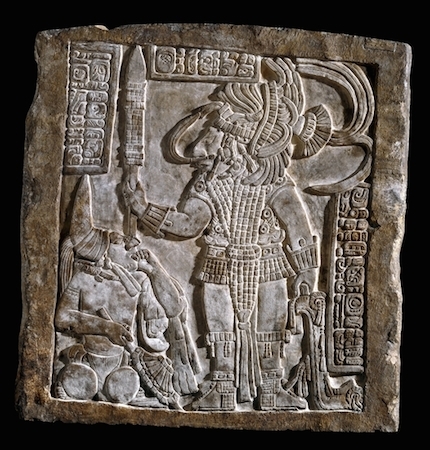 This limestone lintel, considered one of the masterpieces of Maya art, is one of a series of three panels from Structure 23 at Yaxchilán, where it was set above the left (south-east) doorway. 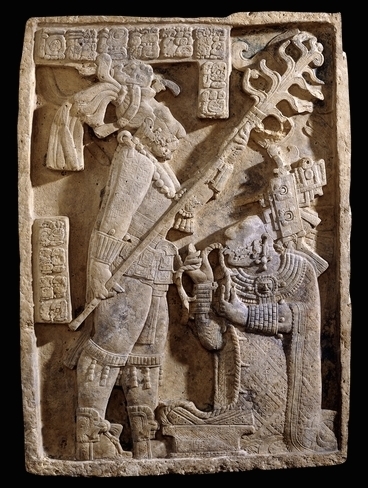 The scene represents a bloodletting ritual performed by the king of Yaxchilán, Shield Jaguar the Great (681-742), and his wife, Lady K’ab’al Xook (Itzamnaaj Bahlen III). Wearing an exquisitely woven “huipil,” Lady K’abal Xook pulls a thorned rope through her tongue in the principal form of blood sacrifice perfomed by royal women. The rope falls on to an open codex. Her pierced tongue allowed her blood to flow as part of a ritual communication with gods and spirits. This sacrifice mirrored the Maya story of creation, when the gods let their blood to create the human race. By choosing to take part in the ritual, the queen demonstrated both her moral and physical strength to the people, and her suitability as a Maya royal. Scrolls of blood can be seen around her mouth. She kneels in front of Shield Jaguar who holds a great torch described in the text as a “burning spear” illuminating a ritual that was probably held at night or set in the dark recess of a private chamber. Both king and queen are richly attired with Sun God pectorals. The human head worn by Shield Jaguar over his brow may be a shrunken battle trophy. Bloodletting was a common practice in Maya life from the Late Preclassic period (400 B.C.E.- 250 C.E.) onwards, and an essential part of rulership and of all public rituals. The Maya élite drew blood from various parts of their bodies using lancets made of stingray spine, flint, bone or obsidian. These objects are often found in burials and other archaeological contexts, though other perishable materials, like the rope and the bark-paper strips seen on the lintel, are now lost. The first two glyphs in the text at the top of the lintel indicate the event and the date on which it took place, October 24, 709 C.E. (5 Eb, 15 Mak in the maya calendar). The last glyph represents the Emblem Glyph (that is, the city name in Maya hierolglyphs) of Yaxchilán. The text on the left of the panel contains the name and titles of Lady K’ab’al Xook. The lintel has traces of Maya blue, turquoise and red pigment. The site of Yaxchilán was only rediscovered in the 19th century as it stood in the midst of the dense tropical forest, and Maya glyphs only began to be translated in the 1960s. V.R. Bricker, “Advances in Maya epigraphy,” Annual Review of Archaeology, 24 (1995), pp. 215–235. J. Marcus, “The Iconography of Power Among the Classic Maya,” World Archaeology, 6 (1974), pp. 83–94. N. Grube and Simon Martin, Chronicle of the Mayan Kings and Queens: Deciphering the Dynasties of the Ancient Maya (London, Thames and Hudson, 2008). V.E. Miller, Yaxchilan: the Design of a Maya Ceremonial City (Austin, University of Texas Press, 1992). D. Freidel and L. Schele, A Forest of Kings: the Untold Story of the Ancient Maya (London, 1990). Cite this page as: The British Museum, "Maya: The Yaxchilán Lintels," in Smarthistory, March 1, 2017, accessed April 20, 2019, https://smarthistory.org/maya-the-yaxchilan-lintels/.